Doug and Vincent started drilling a well in Remoussin on Thursday and by the end of the day had reached a depth of 35 feet. This is very good progress – if we hit rock or clay, the progress can be much slower. We are grateful to God for favorable drilling conditions as well as for His blessing the work and keeping the workers safe. It’s hard to say how deep they will need to go in order to find a adequate water. 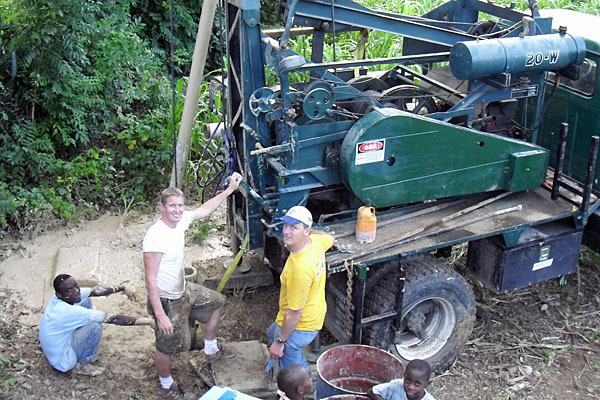 Typically, our wells in this area of Haiti are between 80 and 150 feet deep, although there have been times where we found water at a more shallow level, and on one occasion we reached the extent of our drilling capability without finding water at all. So we continue to commit the process to God in prayer and trust that He will accomplish what He desires. The current cholera outbreak reinforces the need for wells in villages like Remoussin. Without a well, people must collect their water from rivers and streams, a practice that can contribute to the spread of this disease. In fact, in situations like the one in Haiti right now, cholera is most often spread when the water supply is contaminated by feces from an infected person. And that is exactly what is happening. There is no sewage treatment, so the bacteria that causes cholera eventually finds its way into the rivers and streams, putting everyone downstream at risk. Thank you for your prayers, and please continue to pray for safety, health, and that God will provide this village with water through this well. Bernie, along with Doug Jarvie and Vince Buys, arrived in Tricotte yesterday. They encountered a lot of water along the way due to the heavy rains that occurred as hurricane Tomas passed by a few days ago. But with a few detours they were able to navigate past the flooding and arrived safely. The river near Tricotte is still high, and it rained again last night, so Doug and Vince weren’t able to begin their well-drilling yet this morning. But they are optimistic that the river will drop today and they may be able to get started later this afternoon. Cholera continues to be a major concern in Haiti, and it has hit our ministry. Two more children from the orphanage – Anne and Elmath – are being treated at the clinic in Gros Morne. They are out of danger now. Edner, the Orphanage Director, is very proactive. At the first sign of the disease, he makes sure to get the children to the clinic quickly so they can get the antibiotics and fluids they need. A few of the villages where we have schools have been hit pretty hard. Four children enrolled in the school in Corail have died from the disease and three more in David. Remoussin, Drigeon, and Biscaille are also being affected, although there haven’t been any deaths reported from those schools. Norius, our School Director, is working hard to communicate with all 37 Starfish Ministries schools, both to keep us informed of the latest conditions and, more importantly, to make certain our schools are doing everything possible to prevent the spread of cholera and help educate the communities how to deal with this disease. Please pray for all of these needs: for the health of the students, their families, and the teachers in our schools and orphanage; for protection for Bernie, Doug, and Vince; and that God would use Doug and Vince’s efforts to provide clean water to one more village – which will help to prevent cholera there. Thanksgiving season has arrived again! We thank God for the opportunity to serve Him in Haiti. We thank Him for you, our partners in ministry. God is using you through prayer and finances to advance His Kingdom in Haiti. We thank Him for the numerous changed lives – many have trusted the Savior during this past year. We thank God for Pastor Diogene and his ministry team who are so committed to discipling these new believers. We thank God for the thousands of meals that we were able to supply for the hungry Haitians this year. We thank Him for the more than 7200 children in our 38 elementary schools and the opportunity to touch these lives with an education, food and the good news about Jesus. We thank God for the houses we are able to build for earthquake victims. He has supplied the funds, through you, to build and rebuild about 30 houses. As we thank God for you we also extend to you a heartfelt THANK YOU!! Last week before I left Haiti, I visited three of the new house projects. The first one had the walls almost finished. Pastor Diogene and I visited with most of the family for a few minutes – then the father came around the corner of the house. He was dirty with cement and mortar covering his clothes as well as his arms and hands. But what a huge smile on his face! He is so excited about the opportunity to rebuild for his family. And he let us know. He extended his hand and thanked me over and over again and I pass that on to you. This family is getting closer to having a metal roof over their heads to replace the blue tarps that have been their shelter for the past 9 months. The other two sites we visited were not as far along. They were in the final stages of cleaning up the rubble from the collapsed house. It is such a difficult process since there is no equipment available and no place to take the rubble. Their land size is very small – the house covers most of it. So there is no back yard, front yard or side yard to move the rubble to. Most of it ends up out on the street in front of their land with the hope that the city will remove it. That could take days, weeks or even months. But there was definite progress since I was there a month before. These families too are so thankful! You will find a Christmas List here of things that you can give to if you so desire. We truly appreciate your faithful support throughout the year. Hurricane Tomas has been looming with a possibility of hitting Haiti for the past several days. Today Bernie heard from some of our friends in Port-au-Prince that the wind and rain was picking up. But mercifully the hurricane passed to the west. However, the extra rain that’s been falling — even on the edge of a hurricane — still presents significant danger, especially to those still living in tents and other temporary shelters after the earthquake. But at least they were spared a direct hit. Bernie, along with Doug Jarvie and Vincent Buys, will be arriving in Haiti on Monday and traveling to Tricotte on Tuesday. Doug and Vincent will drill a well while Bernie catches up on administrative work. Flooding is a concern, particularly for the drive to Tricotte. So please pray for safety and that they will be able to reach Tricotte and do the work they are planning to do. And of course, pray for the Haitians who would be affected by flooding, both from the initial danger as well as from the potential longer-term effects such as disease or crop loss.